Patios are wonderful places to entertain guests, dine alfresco and relax outdoors after a long day at work. 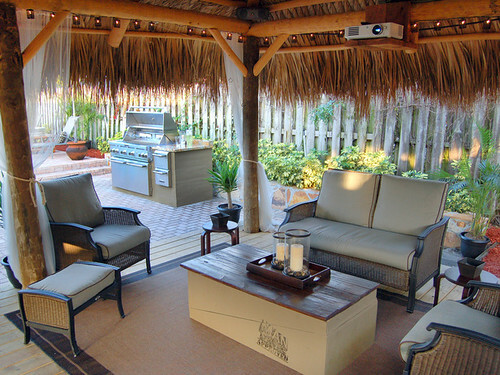 Whether you have a tiny apartment balcony or an enormous backyard deck, creating an outdoor patio area allows you to extend your living space without costing you a dime in construction costs. Measure your available outdoor patio space and trace it to scale on graph paper. You need to know the exact amount of space you have available before you start buying furniture and amenities. Assess your patio to determine what the typical traffic patterns should be. Plan to keep the high-traffic areas clear of built-in amenities and furniture. Consider the layout of your landscape and evaluate any walkways, shrubs or trees that might affect outdoor patio plans. For example, you and your guests might not enjoy dining beneath a draping tree, but the tree might make a lovely decorating element. If you enjoy feeding your friends and family, plan to create an outdoor cooking area with a food prep counter, a grill, a dining table and plenty of chairs. Cocktail party throwers might prefer a patio that includes a built-in bar, a water fountain and a fireplace. 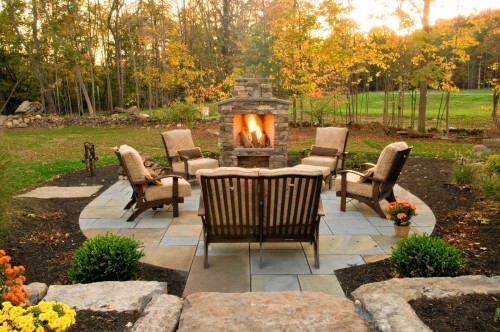 Other ideas include creating a cozy conversation area with comfy sofas or chairs arranged around a built-in fire pit. Reading nooks require walls or landscaping elements that add a little privacy. Get out your outdoor patio plans and draw in any elements to scale. When drawing, make sure you keep any grills, fireplaces or fire pits well away from your house and large landscaping plants. A patio with aged-looking furniture and classic brick flooring will blend better with a traditional house, while outdoor furniture with simple, clean lines and sleek stone floors would probably blend better with a contemporary styled home. A cottage-style home would look absolutely charming with artificial grass flooring, weathered furniture and a little, white picket fence enclosing the patio. Some small balconies can only hold a bistro table with two small chairs. You want your family members and friends to feel just as comfortable outside your home as they do inside. Choose chairs with comfy seats or plush loveseats or sofas. Always include a lot of pillows and cushions so your guests can sink into them and relax. Entertainers should find a dining table that accommodates a large party so guests will want to linger over their outdoor meals. Make sure you leave plenty of clearance around the table so your guests can move around easily. If your patio is right up against your house, define your outdoor space with a bold color. Use vibrant colored rugs to add gorgeous texture and introduce colorful, fun patterns in seat cushions or outdoor curtains. Be sure to use only fabrics designed for outdoor use, however. Hanging lanterns or lights brighten up any outdoor space and add an additional decorative element. String twinkling lights to make a large space seem more cozy or romantic. Place outdoor lights on railings to make a small patio feel larger. Use the above tips to design a comfortable outdoor patio that functions as both an entertaining space and a private retreat. Whatever style you choose, search around online to find the best prices. Online stores such as http://www.artificialgrasssuppliersuk.com often offer less expensive flooring options than you can find in brick-and-mortar stores.